Jaipur has quite a few more things to offer, which we decided to go through on the 3rd day. As we had earlier planned, we decided to visit Pushkar on the 2nd day, to see the only temple for Lord Brahma where he is worshipped as the main deity. The Pushkar lake is also supposed to be very sacred with many deciding to offer prayers for ancestors here. The roads to Pushkar were pretty good, except a few kilometres nearing the destination. We took the help of a guide who took us to the lake and bathing ghats. Priests usually compete to get your attention in order for them to do the pooja for you and ancestors. Since we had gone with the guide, he had arranged for one to do the pooja for us. Since both parents are alive and well, for both of us, it was a small disappointment for the priest as he would have wanted us to make sacred offerings in case of deceased parents, etc. Beware of very smooth talking people who would try to get you to donate huge sums for various causes at this place. We then went to the Brahma temple and had a good dharshan before heading back to Jaipur. We decided to relax in the evening and took up the trip around Jaipur the next day. This included visit to Lakshminarayan Mandir near the Moti Doongri fortress, Albert hall and Museum (gave a miss to the zoo and bird park nearby) and followed by the majestic and huge Amber Palace to the north of Jaipur. 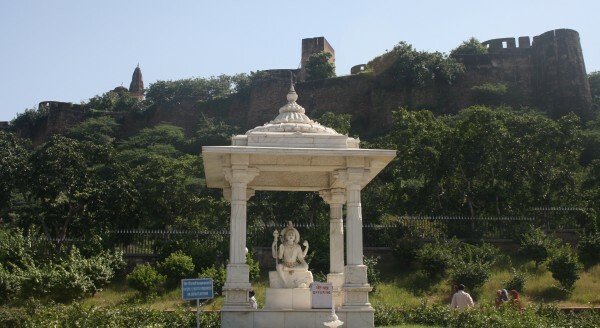 The Lakshminarayan mandir is at the foot of the hillock on which Moti Doongri fortress is built. After a peaceful visit to the Mandir, we decided to go to the Albert Hall and Museum, where the artifacts are just huge in number. Sculptures, paintings, arts, craft, instruments - everything is collected and documented for us to take in. 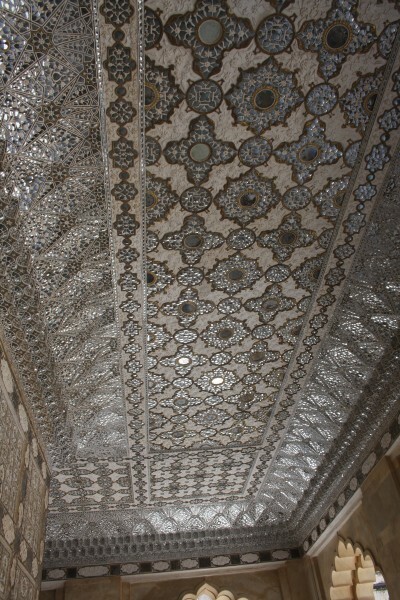 One can spend a couple of days and still not grasp the wonders of the Rajput periods. We decided to take a few photographs for later analysis and went through the exhibit halls before proceeding to Amber Palace. The grand Amber Palace in the Aravalli hills was the next stop. The big fort and palace overlooking the lake is really breathtaking. The size of the construction and using the natural layout of the hills - is really amazing. The paths provided for the people of the area to come over for meetings and celebrations in the huge court-yards, big rooms, sophisticated baths, great view of the hills and natural protection from the fortifications, etc., are indeed stupendous. Again the use of a guide, in this case a person with fluent English, was really useful for us. Then we went to a few places to shop, near Amber palace as well as near Jal Mahal. Courteousness and salesmanship were very obvious and we picked a few things from the variety of shops we visited. In the evening, a second visit to the market rounded off the stay at Jaipur, as we bought a few dresses, nuts, spices, chocolates, etc., before spending evening and the next day relaxing. We indulged further in sweets and good vegetarian food, bought many sweets for distribution to relatives, friends and colleagues before we big goodbye to the Pink city. I truly like to reading your post. Thank you so much for taking the time to share such a nice information . Get More Information About Jaipur Tour Packages. I read this blog ,Very informatics blog Golden triangle packages india The three wonderful destinations of golden triangle have world lever importance. It was nice to read your blog post about Pushkar and Jaipur city. If there is one thing that Pushkar is known for, it is the famous Pushkar Mela; the camel and livestock fair that is held here annually which attracts throngs of tourists from all over the world. Also, check out these popular places to visit in Pushkar. Thank you for beautiful pictures and detailed post. Pushkar is a town in the Ajmer district. With various beautiful places to visit in Pushkar ,in recent years it has become a popular destination for foreign tourists.